Now that spring has sprung, it is important to recognize the stresses that our cats and dogs may encounter and be proactive! Warmer weather means more animal and humanactivity outside. Cats have a very large range of hearing, even more acute than dogs or humans. They can distinguish sounds much higher in pitch than dogs can, and are about equal in terms of low pitch noises. Cats can also detect tiny variances in sound. In nature, this allows them to detect the size of a potential predator. Cats often feel stray and roaming cats are invading their territory. They can show their stresses by misbehaving, urine marking, or aggression towards their housemates. It is important to provide plenty of exercise enrichment, such as climbers, scratching posts, and puzzles, to help reduce stress. Try to keep strays away, and contact your local Trap, Neuter, and Return group to help with outside cat population control if needed. Territorial issues may arise with the activity outside as well. Dogs are very alert to territory encroachments. This could lead to increased barking if dogs feel like their area is being threatened outside. 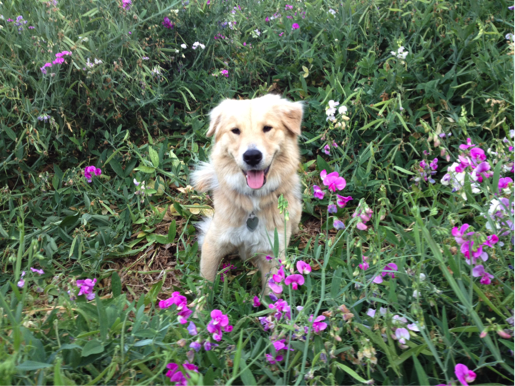 Often dogs enjoy eating new spring grasses to help their bodies detox and adjust to the season change. Studies hypothesize this is an inherited tendency from their wild ancestors. Check your pet’s diet to make sure they are eating a healthy balanced grain free food/treats with minimal carbohydrates (and no added sugars). Adding some fresh vegetables and perhaps a little organic dandelion greens to their diet may be helpful. It is also important to be aware of toxic exposures as the seasons start to change. These could include lawn organic or chemical treatments, compost, garbage, cleaning chemicals, etc. If your pet gets into any of these or has digestive upset contact your veterinarian. Be sure to give them a few sprays of Calm My Digestion for several weeks to help ease their stomach and digestive tract. This will also help with their adjustment during the warmer weather. There are many great solutions to help ease your pet’s mind during these potentially stressful times. For indoor cats, Calm My Cat spray and Calm My Pet Music are both excellent for distracting your cat from the disturbing noises outside so they can relax. Make sure to use on all cats in the household. For your dogs who are reactive to things going on right outside your yard, try Calm My Dog and Calm My Stress to help them be more at ease. Inside, add Calm My Pet Music as well to help them relax and avoid being distracted by noises and spring thunderstorms. 1. Keep the Same Routine- Routines can be interrupted very easily during the holidays. Try your best to make these situations as comfortable as possible for your pet. Even if things change slightly, it is important to stick to their normal routine as much as possible. 2. 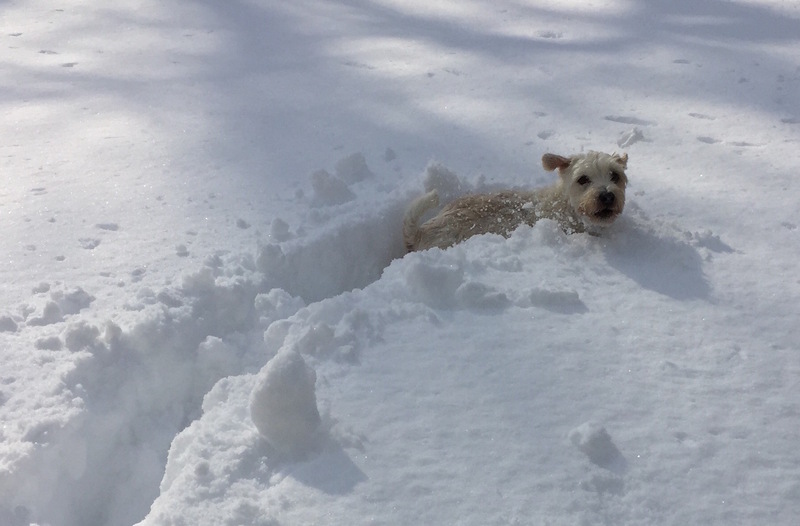 Bundle Up and Get Plenty of Exercise - If you live in a snowy area, make sure your pet is protected from the elements. This may include jackets and snow boots to make sure their paws do not get too cold. Also, you can play fetch in the basement. Another popular activity could be hide and seek with treats, or puzzles to keep them engaged and entertained. 3. Be Careful Introducing any New Treats or Foods- Always make sure to read the ingredients to make sure they are grain-free and natural. Do not feed table food. 4. Supervise with any New Toys or Chews- Especially if there are other pets visiting, there can be stress over dominance and protection of treats/toys. Make sure that all your pets are comfortable with each other, and all new toys and chews are natural and safe. 5. Keep Holiday Plants and Ornaments out of Reach- Trees, including water for live trees, tinsel, ornaments, strings of lights, or cranberries are all potentially very dangerous for our pets. Also, avoid scented candles and other scented items because our pets can be very sensitive to these smells. 6. Store Chocolates and Holiday Cookies Safely Out of Reach- You can always get your pet their own safe treats so they can enjoy the holidays as well! 7. Play CMP Therapeutic Music and Use Calm My Pet Essences- Play Calm My Pet Therapeutic Music to help all your pets feel their best and be relaxed. Use Calm My Pet essences everyday and especially before, during and after company arrives, and any other stressful situations. 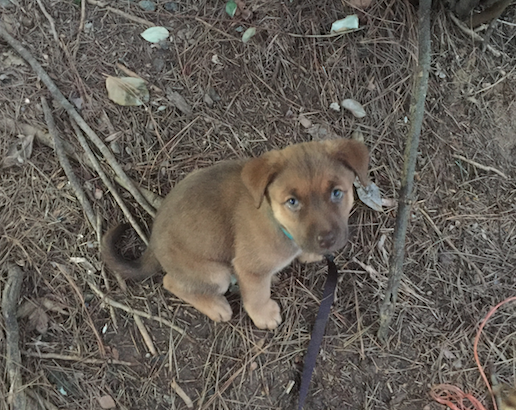 What is the best way to handle bringing home a new rescue dog from the shelter? We will go through multiple ways to make sure your pet is as comfortable as possible for the transition. Many pets, rescue animals especially, have issues from the past that they need to work through. 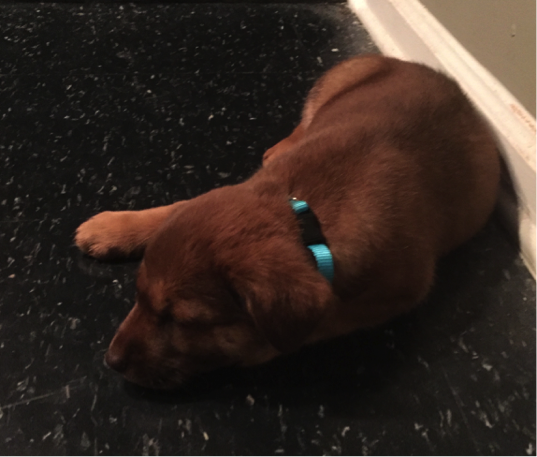 These tips will help make those issues seems smaller for your new pup. 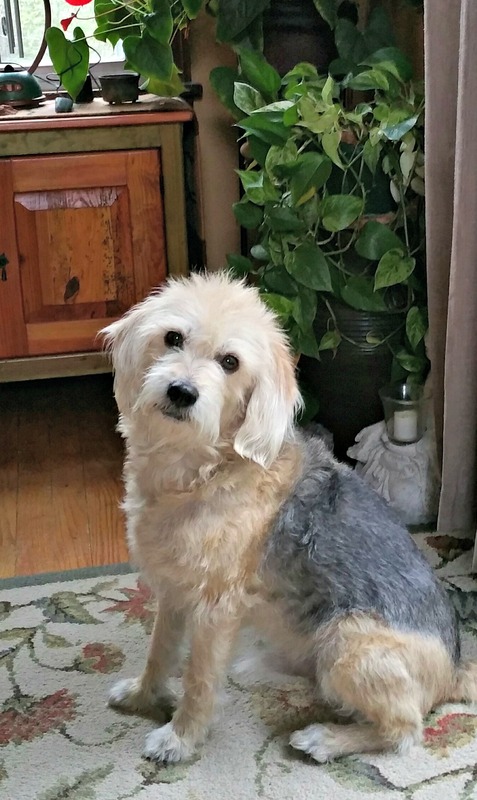 Create a Predictable Routine – Changing homes is a stressful time for dogs. The best way to mediate this is to create a predictable routine for your dog. This means consistent eating times, exercise, and sleeping. Dogs are creatures of habit, and having a consistent routine will help them adjust to their new home and know exactly what to expect on a daily basis. Training – Starting a your dog in a training class as early as possible gives them socialization and skills to know how to act in public, as well as at home. Include training practice in daily routines to give your pup a job. Make training fun for you and your dog! Healthy Diet - A balanced diet is very important for your dog to live a happy and healthy life. Make sure to feed them natural, grain-free foods. Also, it is very important to have treats and puzzle toys to keep your pet engaged during potentially stressful situations. Exercise – Consistent exercise is an essential part of keeping your new dog relaxed and happy. A tired dog is a happy dog. Make sure you exercise your new dog daily, preferably at least two 15-20 minute cardio sessions a day. Also, vary the type of exercises. Between walks, runs, fetch, and interaction with other dogs, there are plenty of options. 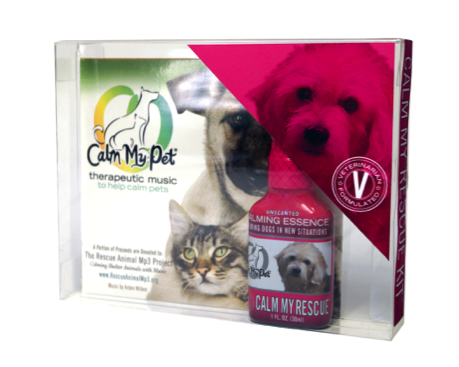 Unscented Essences and Music- Calm My Pet offers a Calm My Rescue Kit, which is made specifically for rescue pets adjusting to their new home. It includes an unscented spray for rescue dog stresses, and therapeutic music performed by a sound therapist to help your dog have an easier transition. 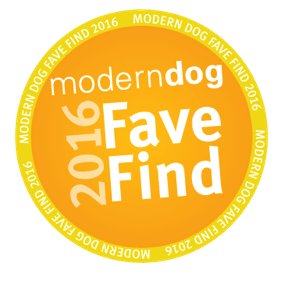 This product was featured as a Modern Dog Magazine Fave Find for 2016! Most of all, be patient and have fun. Your dog can sense your stresses and can feed off of that. So, the more relaxed you are, the better your pet will do! With spring coming to a close and summer right around the corner, it is important to be ready for thunderstorms and how your pets will react. One great way to prepare your pet for thunderstorms is to play the sounds for your pet in a controlled manner. Either record some sounds of thunder yourself, or you could easily find some sounds online to reenact the situation for your pet. While playing these sounds, on a low level, always below fear threshold, feed your pet treats so they associate positive events with the sound of thunderstorms. Every few days increase sound slowly, desensitizing by associating positive rewards with calm behavior. Also, when practicing, make sure they have a safe place to go during the sounds (crate, playpen, etc.). Calm My Stress is made for specific intense stress situations such as thunderstorms. Even during the practice sounds, use Calm My Stress before you start, during and after your desensitization training in order to give them a sense of balance and calming. During an actual thunderstorm, it is best to allow your pet to go into their safe space. Calming therapeutic Calm My Pet Music in the background can greatly benefit pets during the training sessions and real events. You do not need to drown out the sounds of the thunderstorm, but just having that music playing will provide therapeutic benefits. Also, use Calm My Stress, before, during, and after the storm. For more information on how to deal with thunderstorms or other specific stresses, feel free to reach out to us through our contact form. You make have heard of chakras, and the importance of keeping them flowing and balanced. But, it is just important to keep your pets' chakras balanced as well! They have the same seven main chakras as we do, and the more balanced they are, the more relaxed and healthy your pet will feel. The main seven chakras govern the bodies’ processes and energy levels around us. The bottom three in the lower part of the body are associated with survival needs, and the upper four are correlated with mental processes and higher-level emotions. Root (Red) – If this chakra is balance, your pet will feel confident, grounded and safe. If it is unbalanced, your pet may act more nervous or fearful. Sacral (Orange)- This chakra is associated with emotions and feelings. If this is unbalanced, your pet will tend to act more stiff and lack loving emotions that we expect from our pets. However, if this chakra is overactive, it may lead to an overemotional pet that could suffer from separation anxiety issues. Solar Plexus (Yellow)- When the solar plexus is in balanced, your pet will feel confident and in control of their actions. If it is unbalanced, pets tend to act more skiddish. Heart (Green)- We all know that the heart is associated with love. Your pet will act loving and friendly if this chakra is balanced, and more distant if the heart is less active. Throat (Blue) – The throat chakra helps your pet express themselves and their emotions clearly. This is also an important immune center. An overactive throat chakra could lead to excessive barking. Third Eye (Indigo)- This chakra allows pets to interact and live easily with other dogs and people. If it is underactive, they may rely on their owner too much, and possibly become confused. Crown (Violet or White)- The crown is associated with higher level thinking. If it is balanced, your pet will feel comfortable with their place in the world and at peace. Now that you are aware of each chakra, it is easy to see how important it is that each and every one is balanced so that your pet feels their best. Some options to help balance your pet are CranioSacral therapy, massage, energy healing, color therapy, or simply meditating with your pet. Calm My Pet Pendant is made specifically for helping with balancing of pets’ chakras. Each is unique with gemstones and a ceramic bead for EMF protection and grounding. Calm My Pet Unscented Essences also contain energy healing and color therapy to help keep your pets in balance. You can purchase them through our website here: https://www.calmmypet.com/calm-my-pet-pendant-for-protection or go to the “Stores” tab to see if it is carried in your area. The hustle and bustle of holiday season can be stressful for pets. Not only do pets have their own anxiety, but they can easily pick up on their owner's stresses as well. 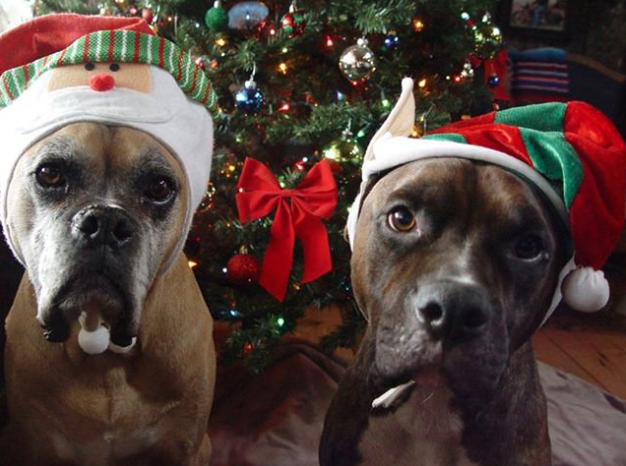 Here are some tips to help your pets stay calm and enjoy the holidays! Keep your pets on a regular feeding and exercise schedule. Make sure your pets get plenty of outside exercise. Explore different parks and outdoor areas. Avoid feeding them human snacks and foods. These can cause upset stomach (and pancreatitis). Give pets a job when expecting visitors. Some examples of this could be a treat filled toy or puzzle, safe space, or ask to sit and reward with treats. Can also throw some treats to make a fun game when people arrive. **Do not use treats or filled toy with multiple dogs in the house. Put pets in a room or crate and give them a treat filled toy to work on. Keep holiday decorations and foods out of reach. Avoid scented products & candles. Play Calm My Pet Therapeutic Music which includes specific tones and frequencies, to provide added calm health benefits while you are home or away. 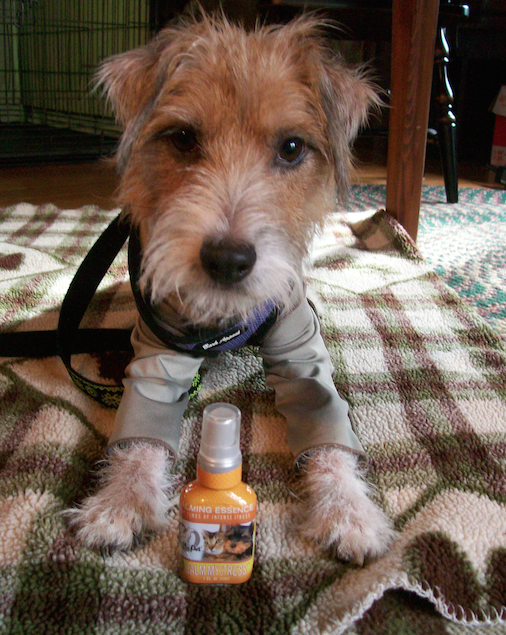 Use fast acting Calm My Pet sprays before, during, and after visitors arrive. These calming sprays also help pets when away from home, boarded at kennels, or at doggie day care. Animals deserve to be calm, even though our lives may be hectic and stressful. Calm My Pet’s mission is to calm and promote well-being of pets through therapeutic music and organic calming sprays. Calm My Pet products can help you and your pets enjoy the busy holidays! I created the Calm My Pet line to help support the nonprofit Rescue Animal Mp3 Project, which donates calming music to animal shelters, sanctuaries, and rescues. 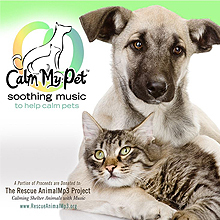 A portion of all Calm My Pet purchases is donated to continue calming shelter animals with therapeutic music. 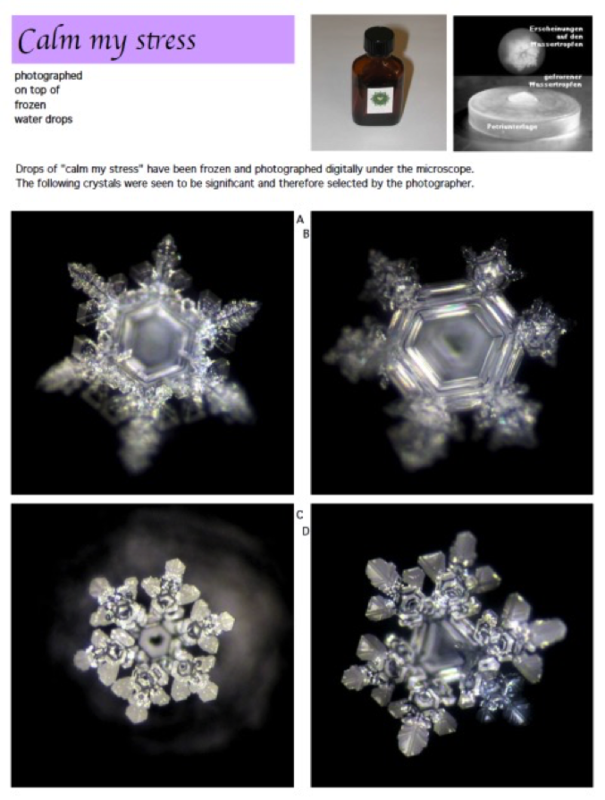 Water in nature can show a natural energy crystalline structure when frozen, as demonstrated in the 1990’s, by the late Dr. Masura Emoto. 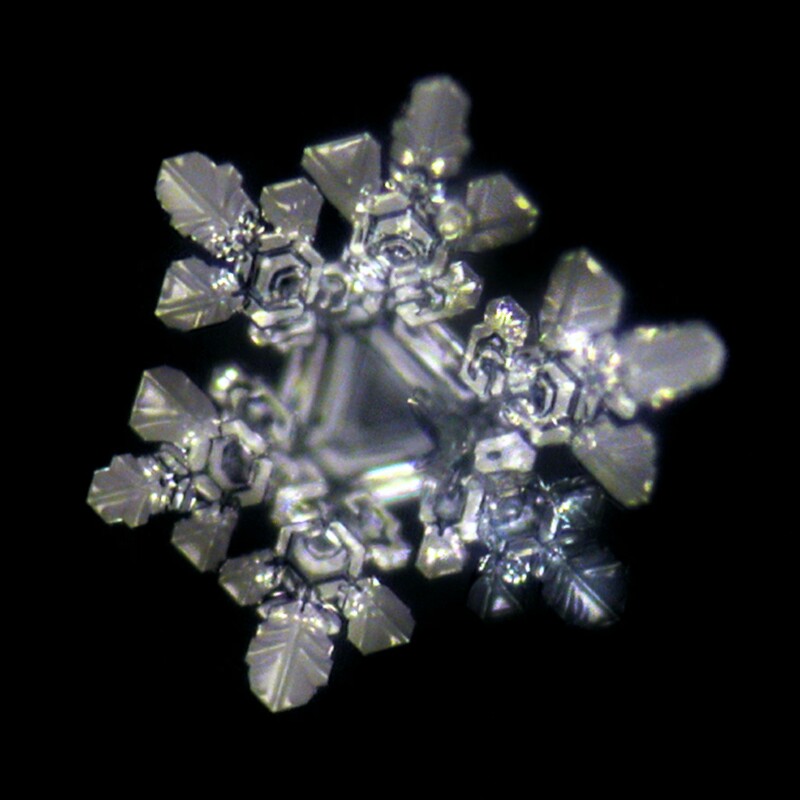 He was the first to freeze water at a certain temperature in order to take microscopic pictures of the crystalline structure of water, similar to snowflakes. He performed a series of experiments observing the physical changes of the water after different variables. After months of trial and error, he finally was able to take pictures of these beautiful snowflakes in water (or water crystals). He explains the process in great detail in his book The Hidden Messages in Water. 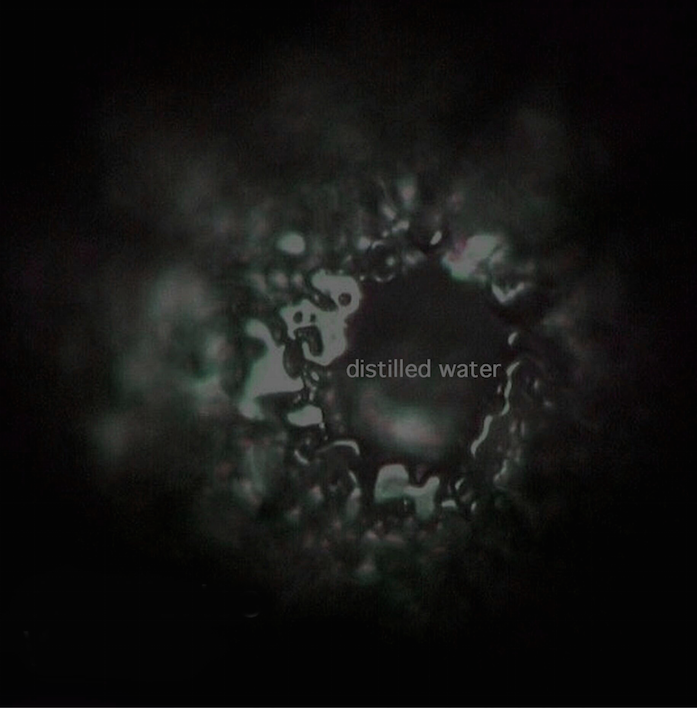 Here is a water crystal picture of distilled water (right). As you can see, there is little to no form to the water crystals. This is very neutral water. Most water is processed in some fashion, which changes its healthy energetic properties and absorption qualities. When we speak about “energized water” and an “energetic signature or vibration” to the ingredients, this is what we mean. As you can see, when frozen at the correct temperature and under a microscope, wonderful crystals form as composition of Calm My Stress. This is in stark contrast to the pictures of the distilled water above. “Energy” and “Vibration” helps unblock stagnant or stuck areas of the physical and emotional body to promote healing and calmness. Since approximately 60-70% of mammals bodies are water, we can see how the natural restructuring energy of water can benefit pet’s well-being. These crystals help to restructure the water in our pets, giving them a balancing and calming vibration throughout their entire body. Copyright © 2015 Calm My Pet, All rights reserved. We live in a high stress world. Pets feel the ups and downs of stress in our daily lives. It is important to recognize all the signs of stress in our pets. Some subtle signs of stress and anxiety include tail down, head carried low, eyes shifted down, lack of focus, digestive and/or skin issues. A few options to help lessen their stresses are giving them jobs to do and fun exercise. Dogs love to be working companions! Their jobs may include playing with their toys, and doing their commands to learn calm confident focus. Always treat or verbally reward for calm acceptable behaviors. 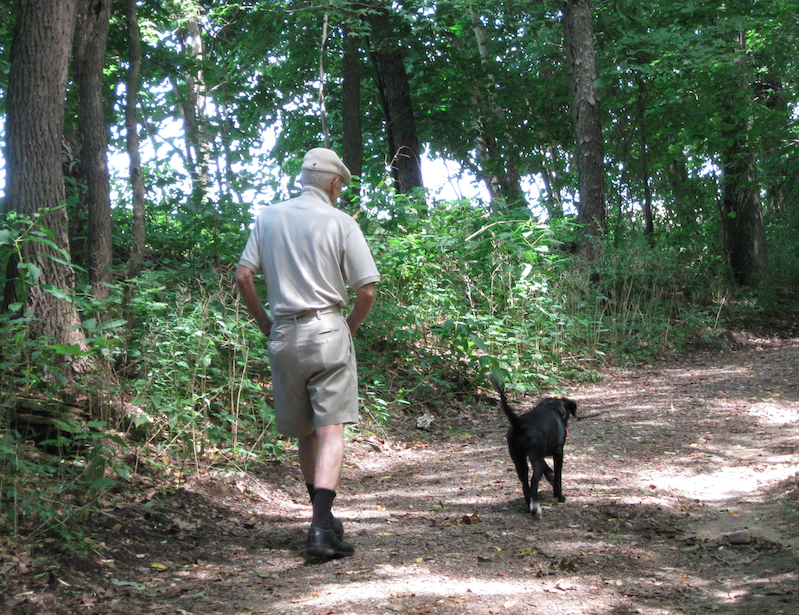 These daily routines help maintain our pet’s emotional and physical balance. Pets enrich our lives while teaching us many life lessons. Food quality and quantity is very important to help our animals feel their best. I recommend diets that mimic what an animal would eat in the wild. This includes high quality grain free, unprocessed freeze-dried or frozen nutritionally balanced foods. Remember, “You are what you eat!” Excess weight stresses the body in many ways, so please keep your pets lean and use fresh vegetable treats. Always read the labels of food/treats to make sure you are feeding them highest quality meats and vegetables. Play games like Find It or Hide & Seek, using kibble or treats. You can feed your pet their whole dinner by having them look all over the place for it, or running back and forth to small plates of food. Exercise is very important to provide new situations to gain confidence and release stress. Always take along 100% meat treats to work on focus and fun commands during walks and encounters with other people and animals. Ask to “Sit” and reward with a treat. I like using the “Touch” command to help encourage confidence in shy dogs who are afraid of hands moving towards them. Rub a little scent of a treat in the middle of your hand, hold hand palm up letting your dog investigate. After your dog touches his or her nose to your hand pair it with the word “Touch”. Do this a few times daily and then move your hand to different positions to make it a game! Positive Training & New Tricks - Chill Out Fido is a great book for focus training, available on our Products Page. Does your dog show interest in new toys only? Try hiding certain toys for a few days, just leaving him or her with a few to play with. Then you can switch them out every couple days, giving your dog that excitement each time you bring a new toy out from hiding. *Caution using food rewards & food dispensing toys with multiple animals in the house unless animals are crated. Proper technique is very important when de-stressing a dog. Our FAQ Page has specific tips for different stressful situations one could face and the best way to address them. This way, your dog is sure to relax and heal him or herself in the easiest possible way. We recommend spraying Calm My Pet products on your hand and pet onto dog’s fur, and/or spray in their water bowl. It is very important to use Calm My Dog on all dogs in the household. Calm My Stress works great for stressful situations, such as separation, storms, at the kennel and vet visits. Use Calm My Stress before, during, and after any of these events to soften the stress in your dog’s life. Playing Calm My Pet Music while you are home and away also gives them a great sense of comfort and has healing properties. Using these techniques with Calm My Pet products, your dog will be on the road to living a happier and healthier life! It is very important to provide exercise enrichment for your cat. Not only does it entertain them, but it also helps lessen stress supporting a healthier life. Food can be heated with some warm water (no microwaving) and be served on a flat (glass or ceramic) plate. Shallow glass bowls can be filled with purified/filtered or spring drinking water. To encourage drinking, a porcelain or stainless drinking fountain can be used. Also, it is important to have two separate feedings. Avoid dry food. Use grain-free canned, frozen and freeze dried foods balanced foods. With a multi-cat household, it is very important to have individual dishes for food and water. Each cat should be provided with his or her own litterbox (plus an additional extra one) and scratching post/ tree as well. Cats are very territorial, and sharing can easily lead to tense interactions. Exercise is very important! Make sure to exercise each cat separately, with a hunt, catch, feed process. 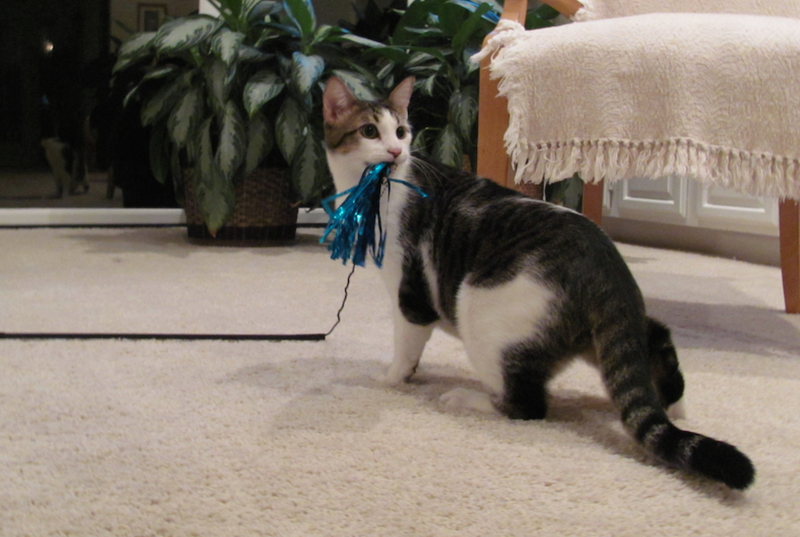 Use a toy or laser to let them chase until they are tired, let them “catch” the item, and then feed them their meal. It is best to do this twice daily before meals. Cats also benefit from natural cat trees and climbing areas, window seats/beds, and tunnels for each cat. It is important to keep their routines consistent. For cats that are older or have trouble exercising, try hiding food/treats in different rooms of the house so they have to search for it. Also, if a cat is waking up too early, try to exercise right before bed. You can gradually move their dinner time back 15 minutes until 9pm at the latest. Litter choices should include unscented, all natural, non dusty materials. Uncovered boxes are desired by most cats and avoid placing them in narrow areas where another cat could ambush or block them from access. Some cats like a deeper layer of litter than others. Experiment to see what your cat prefers by tilting a full litter pan, so the litter is ramped higher on one side. See what area your cat prefers to use. Stick to the same litter type and fill level your cats prefer. All of these techniques work excellent in combination with Calm My Cat. We recommend to spray on your hand and pet into each cat’s fur, and/or spray in each water bowl. It is very important to use Calm My Cat on all cats in the household. Calm My Stress also works great for stressful situations, such as hiding when visitors arrive. Try to use Calm My Stress before, during, and after the event to soften the stress in your cat’s life. Playing Calm My Pet Music while you are home or away also gives them a great sense of comfort and provides healing properties. With these techniques as well as the use of Calm My Pet products, your cats will be on the road to living happy and healthy lives! People utilize holistic therapies to keep themselves healthy and happy. We use these techniques to relax, de-stress, and heal on many levels. However, many are unaware that these alternative therapies are available for their pets too. Animals find massage and various sorts of energy work helpful for staying on a healthy path. I know this to be a fact because my world revolves around healing pets. After many years in traditional small animal practice, I felt that alternative healing choices could greatly benefit our pets. I began pursuing training in these holistic techniques. 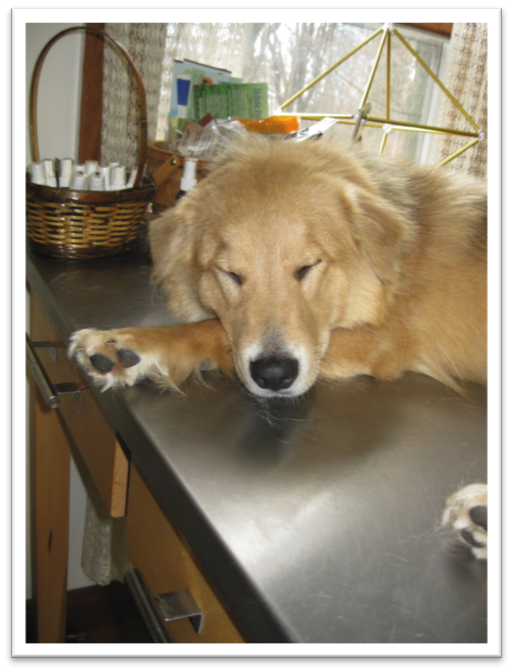 Currently, I have been practicing holistic veterinary medicine for over 18 years. I work with animals to improve their health and quality of life by utilizing alternative, holistic health care methods. Every day is a new opportunity for me to learn from both the miracles and the challenges I encounter. My teachers are the four-legged creatures that surround me. I strive to stay focused with careful attention, so I may learn the lessons that these pets can teach us. My clients come to me seeking help because their pet can’t explain the issue or research the condition. Both the clients and their animals look to me for healing. The pets need only to look into my eyes to see my willingness and ability to help. Color Therapy uses color and light to balance energy of the physical, emotional, spiritual, or mental body. Specific colors may be applied by lights, essences, fabrics, gemstones, or colored glasses. Color can be targeted at energy centers and acupuncture points to bring homeostasis (balance) to the body. Reiki (Universal Life Force Energy) is an ancient Japanese art of natural healing. With this Touch Healing technique, the healer uses his or her hands to transmit healing energy to balance the physical and emotional body. Reiki brings about deep relaxation, destroys energy blockages, detoxifies the system, provides new vitality in the form of healing universal life energy, and increases the vibrational frequency of the body. Healing Touch for Animals® (HTA) is a compilation of bio-field techniques by Carol Komitor, LMT, CHTP to facilitate the healing process. Healing Touch for Animals works with the energy body to provide the correct physiology (balance of systems) so the body can heal. HTA provides the techniques to support this process. HTA helps with emotional, physical and behavioral issues. It works by releasing endorphins to establish a deeper relaxation and state of being, allowing the body to function at a greater energy level. By allowing muscles to relax, circulation is increased, sending more oxygen, nutrients, and hormones into the body to support healing. Both HTA and Reiki are bio-field, energy-based healing modalities. CranioSacral Therapy (CST) is a light touch technique, which enhances the body’s natural healing processes. Osteopath John E. Upledger developed this intuitive guided therapy. Generally using pressure equal to the weight of a nickel, the body is evaluated and gently manipulated to help the body release any restrictions and promote the normal rhythm and flow of the musculoskeletal and nervous systems. The length of time and the number of sessions needed is extremely variable and depends on, among other factors, the complex layers of the injury or trauma. Certain injuries may mask the original cause of the problem as a defense mechanism for the body. This gentle approach follows the body’s lead to uncover the source of pain or dysfunction and can open the path to wellness. Massage and Acupressure help your pets physically and psychologically, aiding to relieve distress, anxiety and discomfort. Research shows that animals that are handled when young learn faster and have more advanced neural development compared to animals that are not. In humans, massage has been known to raise the pain threshold and reduce treatment soreness. It can calm or energize. These same results are seen in working with pets. Massage can be used as a prevention measure for canine athletes. Other benefits include toxin release, increase in flexibility, confidence building, and energy restoration. Holistic pet therapy is a way of giving back to our companions for all the unconditional love pets give us everyday. Most pets are healers in their own way and often reflect our illnesses. We can learn to help both them and ourselves by addressing physical, spiritual, and emotional unbalances. As we attempt to achieve balance for our pets and for ourselves, we will see the healthy vibrations resonate through our lives and the world. These techniques are very similar to what we strive to create with Calm My Pet products. Our products are made with similar techniques in mind as those stated above, and they can be used to promote balance both physically and emotionally. They can either be an augment to the therapies you currently use or as standalone products to help your pets feel their best. **While holistic pet therapy is a wonderful complement for your pet's health care, always seek veterinary advice before starting any therapy for your pet.